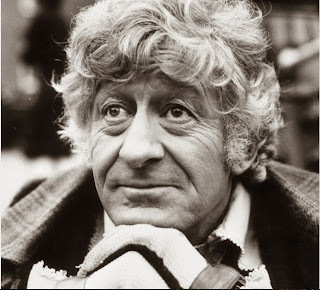 Jon Pertwee, son of actor and screenwriter Roland Pertwee, was born in Chelsea on July 7, 1919. He was expelled from multiple schools, including the Royal Academy of Dramatic Art, for refusing to play a Greek "wind" during a lesson; he stated that it was a waste of his fathers time and money. Young Pertwee was also accused of defacing bathroom walls with rude statements about tutors at the school. Pertwee was an officer in the Royal Navy and spent time with the top secret Naval Intelligence Division during World War II, alongside "James Bond" author, Ian Fleming. He woke up with a cobra tattooed on his arm after one drunken night during he time in the Navy. He began his foray into show business after the war, beginning on radio programs and then making his way to the stage and television. In 1969, Pertwee asked his agent to send in an application for the role of the Doctor, but was surprised to find out that producer Peter Bryant had already added him to the shortlist of actors being considered for the part. Ron Moody was the producers first choice, however he was unavailable, so Pertwee got the part. Pertwee's third Doctor had a zest for adventure and fancy clothing and reigned for five seasons from 1970 through 1974. He announced his departure in 1974, as he wished to return to the stage. He later cited that typecasting, the departures of co-star Katy Manning and producer Barry Letts, and the death of co-star & close friend, Roger Delgado, were catalysts in his decision to leave the show. He continued to act, most notably in the show "Worzel Gummidge," up until the mid 1990s. He continued to be a part of the "Whoniverse," making appearances in "Doctor Who" specials and at conventions. Jon Pertwee died in 1996 of a heart attack, just six days after the American airing of the "Doctor Who" TV movie. The BBC version of the film added a dedication to him at the end. With the permission of his widow, Ingeborg, his voice was used as a plot point in the Big Finish Productions 40th Anniversary Doctor Who audio drama, Zagreus.